Hello everyone and welcome back to my blog for another beauty review. This was requested by a Facebook follower who has recently bought the Smashbox pore minimizing primer but wanted to see how it looked on oily skin, which is also acne prone, and this is where I came in. And of course don’t forget to follow this blog, and like this post for more beauty related reviews. This product retails for £28 on the main Smashbox site however if you click on the photo above, you will be taken to amazon where the product is available for £27.30. Say goodbye to visible pores! Prime to perfection, plus dramatically blur and reduce the appearance of pores instantly and for up to 8 hours. WHY YOU’LL LOVE IT: This non-drying formula also absorbs oil all day for flawlessly smooth, shine-free skin. This is a picture of my face with no makeup. My pores are enlarged, my skin is red, and I have a few breakouts due to hormones. My skin is a combination of oily, especially around the T zone and my cheeks are dry. I have been looking for a product that can reduce the size of my pores and make my skin a good surface to apply my foundation. This is what the primer looks like. It is extremely soft but blends out and dries instantly on my face, leaving no sticky or cream like residue behind. It makes my face feel very smooth afterwards. Even though it looks like it has a pigment in it, I can assure you it dries clear. Here is a after photo, a minute after application of the pore minimizing primer. You can still see some pores, however they are dramatically reduced compared to the previous photo. And after all the product states to minimize, and not completely hide the appearance of pores. I find this primer somehow helps reduce redness on my face. This picture shows you before and after the application of the pore minimizer. I love the results and this was after using a very small amount. I am super impressed and I am glad I bought this product. It is worth the money, and will last you ages, because a small amount goes a long way. I hope the pictures are persuasive enough to make you want to buy this product, I know for sure I am going to be buying more of this primer in the future. If you liked this post don’t forget to follow this blog and my other social media accounts, and most importantly please like this post, and share it around. Today I bring you my new favourite and holy grail primer by Urban Decay Cosmetics. This primer is focused on minimising/perfecting pores, and improving overall complexion. Minimize the look of pores and fine lines! Smooth on a little Primer before foundation (or on bare skin) for a soft-matte finish without a greasy feel. Smooth on a little Pore Perfecting Complexion Primer Potion before foundation (or alone!) to totally minimize the look of pores and fine lines. The velvety, paraben-free formula flashes down to a soft-matte finish, without the greasy, heavy feel sometimes associated with foundation primers. The result? Flawless skin with an airbrushed look and feel. Foundation applies smoothly, evenly, and won’t fade away. Ideal for oilier skin, but dry complexions who want pore perfection will love it, too. All I have to say about this product is YES! It is the best primer I have used so far and I do not think I will be changing to any others any time soon. This primer has worked wonders on my skin. The background on my skin is; I have rather large pores on my nose, between my brows and across my chin, you could say my whole T zone has large pores. This has been a problem in the past as they stand out and I become very self conscious thinking people are just staring at my face, in my problematic areas. Since using this primer I have noticed my pores are minimized straight after application. I do not dab the product into my skin, but instead lightly rub it across the areas I need it most, which is the T zone and a little on my cheeks. Now with this product a small pea sized amount will do the job! After applying I then move straight onto my foundation which I apply using a beauty blender. I find that my skin looks matte throughout the day and my foundation stays put for a good 6-8 hours if I do not set my foundation. I have had no issues with my foundation sliding across my face or coming off since using this primer. You can buy this product online if you’re unable to find a local store. The primer looks like it will give colour to the skin but infact it is completely clear and leaves no shine behind. I was able to buy mine in House of Fraser. This retails at £19.50 and it is a very large size. I bought mine the beginning of April and I still have loads left, and I use this nearly every day. To me that is a an amazing deal. I give this a 5 star review. If you have tried this primer or any other brands that help reduce oil and pores on the skin, then please feel free to leave the name of the brand and the product in the description bar below. After all we are all here to learn and improve. Today I bring you my comparison between two primers, duh duh duuuhh…. The two I have chosen are both drug store brands. – Maybelline New york Baby skin, instant pore eraser. – L’Oreal Paris, Skin Perfection. Maybelline New york- Baby skin, Instant pore eraser. My first thoughts on this product is that I like the packaging it looks really cute, and bold which is good to catch the eye. I was a bit skeptical of this primer as a few people said it was a dupe for Porefessional but then these claims were being disproved, however I needed a primer and thought I would give it a go. The primer does make my skin feel smooth, and it does have a silicone texture to it. When I first tried this primer it went on my skin smoothly and filled my pores, however it does feel greasy and it did not stop my skin from becoming shiny through the day. I would suggest this as a primer for people who have dryer skin and just need the skin softer for makeup. I was originally looking for the miracle blur primer which I have seen used by makeup Guru’s on Youtube however I cannot seem to get it in England and cannot find it on Amazon either, so when I saw this in Wilkinson I thought I would give it a go as it claimed to do exactly the same thing. 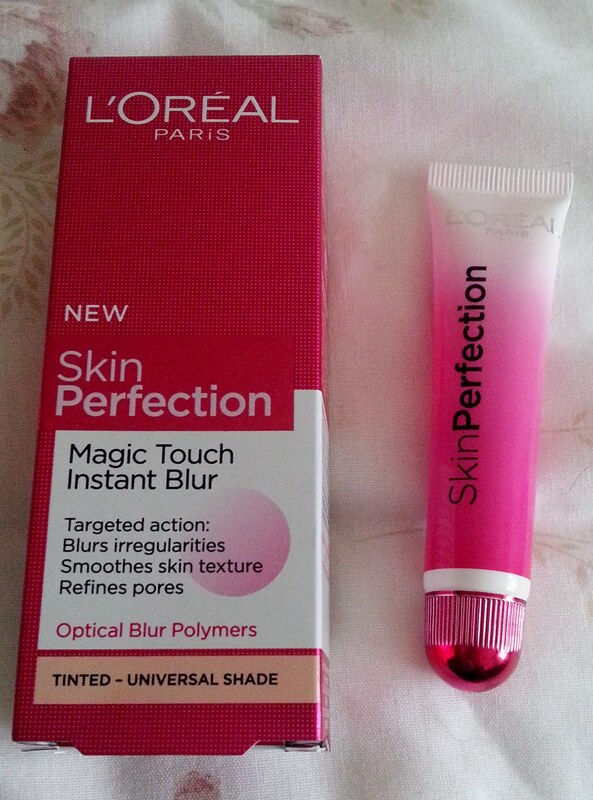 The packaging is not as nice as it could be especially coming for L’Oreal, however the pink does catch your eye. I was dissapointed at first when I saw how small the tube was when I took it out of the box at home, after all I paid £8 and was expecting a bigger tube for a drug store brand. However this primer works really well and I do not know why I stopped using it. It has a very thick consistency so it is a little hard to apply to the face however, this primer smooths the skin makes imperfections look reduced, and my pores are instantly invisible (BONUS). And the best thing about this primer is that my skin stayed matte for about 6 hours, and that was really good considering I was working on placement as a student nurse which is hard work. 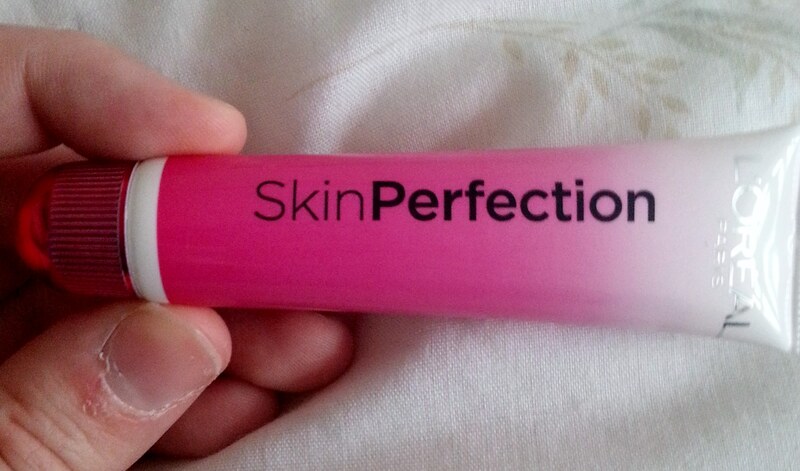 However the primer that stands out to me would have to be the L’Oreal Skin perfection as it did everything I needed it to do, and like I said before the only downside was that this primer was a little more expensive than the Baby skin and a lot smaller. For more comment below and follow me via my media icons in the right bar. Speak soon and don’t forget to check out my other posts and follow me. 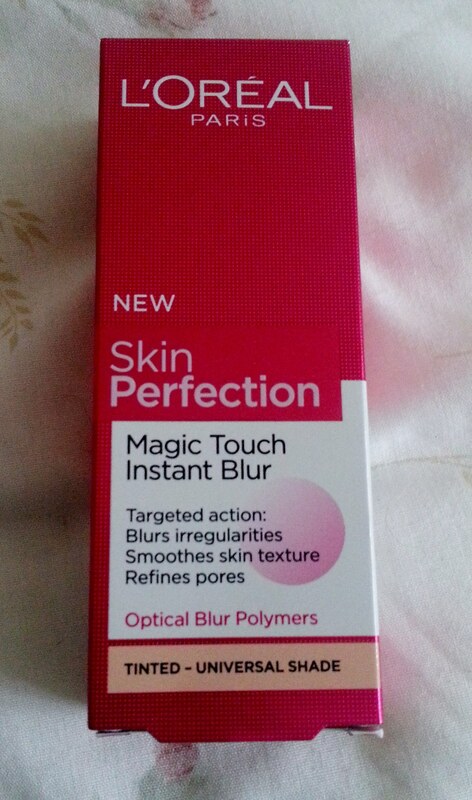 Skin Perfection Magic Touch Instant Blur. I LOVE LOVE LOVE this product!. I have heard about this product via Youtube and I believe this product looks a little different in America than here in England, so it may look a little confusing to some of you. Anyway I thought I would give it a go I believe it cost about £8 I bought this from Wilkinson and thought it was a very good price. The only downside to this product would have to be that it is a very small tube for £8 I wish it was bigger. Anyway it does not state that it is a primer however it definitely works well as a primer. The advanced formula enriched with Optical Blur Polymers, helps smooth and improve the appearance of skin quality, as if perfected picture-perfect skin from every angle. I agree with this completely, this if the first primer/cream that actually works as it states on the box. I find I have very large pores on my nose and chin which I can never seem to hide with any amount of makeup. I used this product last week for the first time for a 12 hour shift and this cream lasted all day and made my skin feel so smooth and matte I was shocked. The consistency of this product is very thick but my skin feels so soft and my pores immediately vanish from my face it is amazing, just like editing :p.
I have very oily skin too so for this product to hide my huge pores and keep my skin matte all day I am now officially addicted, and I would definitely say this product is worth buying I know I will be buying this in the future, especially because it is so affordable and I do not have to pay for expensive products such as Benefit or Smashbox. Please follow me via Twitter for regular updates and follow me via bloglovin or just follow this blog by clicking the link in the right hand bar. 🙂 speak to you all soon.